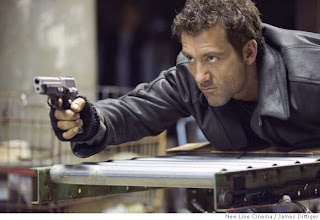 “You know what I hate?” Clive Owen’s Smith asks repeatedly throughout Shoot ‘Em Up before revealing several pet peeves (including littering and changing lanes without signaling) like a child telling a knock-knock joke, begging for a participant to get to a predictable punch-line. The only difference is while the kid hopes for a laugh, Owen’s Smith just wants to find an excuse—any excuse-- to shoot one of the eighteen guns he fires in British writer/director Michael Davis’ gleefully ridiculous riff on action movies that according to IMDb reportedly leaves one hundred characters dead and fifteen gallons of fake blood in its wake. As a name, Smith seems to stand for "gunsmith" but just as well it may stand for Mr. and Mrs. Smith, the tongue-in-cheek trigger-happy gun-toting smooth operators in Doug Liman’s bloody action comedy starring Angelina Jolie and Brad Pitt. However, Shoot ‘Em Up’s laughs feel more forced and sinister and Davis sets up the film’s tone within minutes as Smith eats a carrot like a vicious Bugs Bunny and uses it as his first weapon until a gun is handier when he intervenes in assassins trying to kill off a pregnant woman, who incidentally is going into labor. If one can stand the opening (without shutting it off or walking out) that has Smith firing away at bad guys and delivering a baby on whom he decides to use a gun to sever the umbilical cord to free the newborn from a mother who quickly gets murdered by the villains, then Davis has successfully lured you along for the ride even as it gets more increasingly difficult to stomach and over-the-top as Smith (holding the baby like a football) jumps through plate-glass windows to escape the thugs led by a maniacal Paul Giamatti (Sideways).